The tight turns and small footprint of the SmartFlex Helix Conveyors provide facilities with greater flexibility in layout for applications such as accumulation, buffering, cooling product and more. 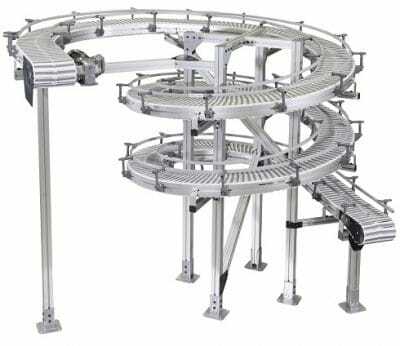 The SmartFlex Helix Conveyors’ infeed and outfeed can be positioned at any height or angle. Custom infeed and outfeed lengths allow the conveyor to extend beyond the spiral, reducing the number of conveyors required. Helix Conveyors can be set at incline angles of up to 7° with a flat top chain and up to 10° with a friction top chain. Both use Dorner’s patented chain design, employing sealed ball bearings to reduce friction. The patented side roller chain also reduces corner friction, allowing for faster speeds and smooth product handling. In addition to the option of a flat top or friction top chain, Helix Conveyors offer a variety of options and accessories including two end transfer options: a roller transfer plate, or a powered transfer plate for smooth transfer of parts as small as 3” in diameter. Three different conveyor widths and four different guiding options are also available. Learn more about the SmartFlex Helix.